In animal training, there are seven techniques available to trainers to obtain desired behaviours from their animals. The most popular technique in the equestrian world is aversive stimulation (or the negative reinforcement technique) where the rider introduces an unpleasant stimuli (such as a pull on the rein or a kick of the leg) that the horse works to escape or avoid. When the animal has performed the desired behaviour such as stopping or moving forward then the aversive is removed (the rider stops pulling or kicking) causing the desired behaviour to be reinforced. However there are additional, effective techniques that many equestrians aren’t aware of. Theses are capturing, free shaping, mimicry, moulding, luring and targeting. In this article we will focus on the use of targeting for humane and effective horse training. What is targeting and why use it? 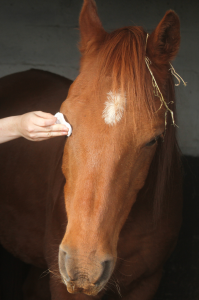 This horse has learned to target with his eyes, this makes eye care an easy and safe task for his owner as he willingly position his eye on the cotton pad without the need for restrain. In targeting, the animal learns to touch objects (called targets) with different part of his body. Once the animal has learned to target, the trainer can position and move the animal in about any desired position. Targeting is used with positive reinforcement – this means that the behaviour of touching the target is reinforced and maintained with the use of rewards such as scratches and food. Targeting has been used with many species of animals successfully. For example, zookeepers may use a target to get a giraffe to put and keep her head down while blood is drawn from her neck or to guide a hippopotamus on a scale or a komodo dragon in a transport crate. And what about horses? Targets can be used from the ground to teach a horse to give his hooves for hoof care or to teach a youngster to lead quietly. Under the saddle they can completely replace the use of negative reinforcement to direct the hindquarters or shoulders. A clicker is a small noisemaker that produces a distinctive clicking sound when pressed. You may have seen this small device used by dogs trainers who practice clicker training; an animal training method using the clicker in combination with positive reinforcement. The purpose of the click is simply to create a bridge between the desired behaviour and the reward that follows. It precisely informs the animal that what he is doing right now is good and will be rewarded. In the context of target training, the clicker can be used as the precise moment the animal is making contact with the target but other sounds such as “Yes!” or a whistle can be used for the exact same purpose as long as it is always followed by a reward. Typically the first targeting point animals are taught is their noses. It is relatively easy to teach as most animals will approach and even touch objects with their nose to investigate. For your targets you can use about any safe, none threatening objects such as a plastic cone, a fly swatter or a tennis ball at the end of a recycled whip. Step 1: Place yourself by the side of your horse and present your target with your arm extended away from your body and toward the horse’s nose. Make sure not to touch the horse’s nose with your target or to threaten him. When both handler and horse are quite experienced in positive reinforcement based training, the trainer can safely use his hand as a target. 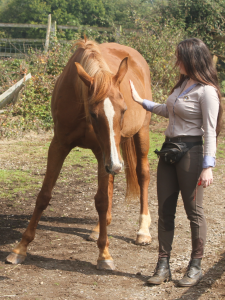 Here the mare is moving her shoulders toward the handler’s hand. Step 2: When the horse touches the target with his nose, click (if using a clicker) or use whatever signal you have decided to indicate to the animal he done the right thing and that a reward is on it’s way. If your horse is more timid and won’t touch the target straight away you can start by clicking and rewarding smaller steps such as small head movements in direction of the target. Step 3: As soon as you clicked, remove the target from the horse sight and reach in your bum bag to get out his reward. The less delay between the desired behaviour (touching the target) and the reward, the quickest the horse will learn the skill. Don’t forget to deliver the reward in a safe and consistent manner. Read our previous article for tips of safe used of food reward. Step 4: Repeat the process a few times (20 times maximum) before ending the session. Make sure that whenever you are working with rewards you follow an end of session routine such as placing a handful of food on the ground and taking your bum bag off to make it clear when reward training is no longer available. Most horses learn to nose target within the first two training sessions. If you enjoyed training your horse to target so far you can take it to the next level by teaching him to follow the target in movement and put this skill in practice by using it to guide him over obstacles (eg. tarpaulin, poles, water), away from other horses (this is a powerful tool for horses suffering from separation anxiety) or to a location (eg. stable, horsebox). 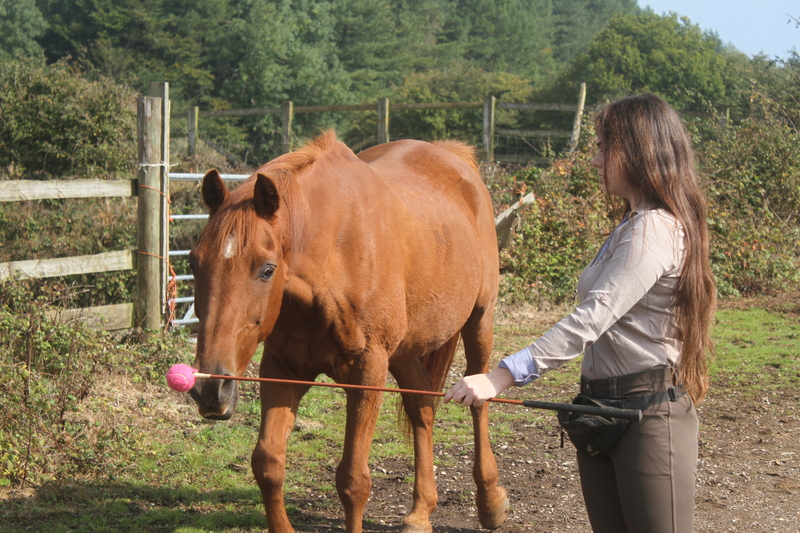 You can also start teaching other targeting points such as hooves, shoulders and hips target. Remember to keep your training safe and positive and not to hesitate to get in contact with a trainer or behaviourist who specialise in positive reinforcement based training if you require any help.